As a part of the central nervous system, the optic nerve goes through the comparatively independent intraocular and retrobulbar pressurized cerebrospinal fluid cavity. Additionally, the central retinal vein and artery pass from the optic nerve head through the optic nerve and the orbital cerebrospinal fluid (CSF) space. 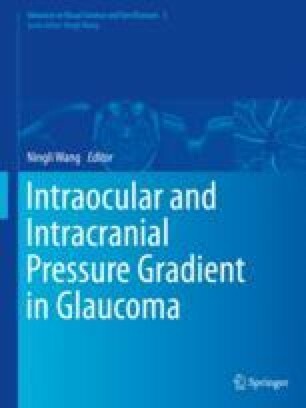 The CSF pressure, as the counter pressure against intraocular pressure (IOP) from the opposite side of the lamina cribrosa, may have pathophysiologic importance for several intracranial and intraocular pressure gradient-related ophthalmic disorders, such as glaucomatous optic neuropathy associated with CSF pressure dysregulation [1–12], optic neuropathy secondary to idiopathic intracranial hypertension [13–19], visual impairment syndrome in space [20–22], and retinal vein occlusion . We would like to thank Ning Tian for drawing diagrams for this chapter. Ning Tian, designer at Beijing Tianming Ophthalmological Novel Technology Development Corporation, 17 Hougou Lane, Chongwenmen, Beijing, 100005, China.